Home \ Blog \ L’Chaim or LaChaim? 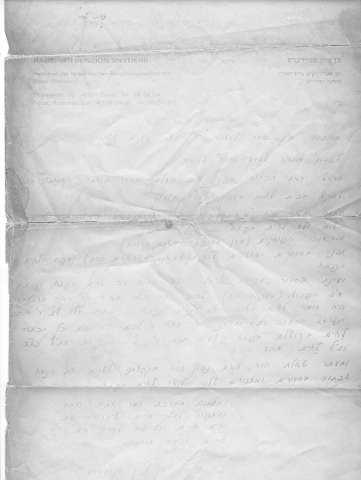 In the early days of the fax machine my father was asked to receive a fax of a sheiloh (halakhic querry) to Rav Schwab Zt’L from Rabbi Snieders of the IRG Shul in Basel. The question being wether to follow the nekudos (annotated pronunciation) of the Roedelheim Machzor which has the gramatically preferable “Zochreinu LaChaim”, (Remember us for life) inserted during the 10 days of repentance- over the advice of the Poskim on the Shulchan Aruch and the Mishna Berurah. Rav Schwab answered in the affirmative stating that since the Ba’al Hafla’ah (Rabbi Pinchas Horowitz ZtL), the last Rav in Frankfurt before the Kehilla came under the oppressive forces of the Reform religious council, had given his approbation to the Roedelheim, one can rely on this annotation. Hebrew text and original correspondence below. There was an article in the Mitteilungen explaining the two sides of the isuue by Rabbi Yisroel Strauss linked here. As noted there, in Breuers the majority of those davening before the amud are using the L’Chaim and not the Roedelheim’s text. So Rav Schwab was just okying the strict following of the text for a place that has no established minhag and not advocating the Roedelheim uberall. This is a previously unpublished correspondence of Rav Schwab ZtL. והנה בסידור’ם ומחזורים שלנו (שאנחנו משתמשים בהם) נדפס לחיים בפתח. ועיינתי בסידור עבודת ישראל, ושם כתוב גם כן לחיים בפתח, וכותב ע”ז בפירושו ( בתפילתם ר”ה) כתב הטור הם”ר מאיר מרוטנבורק היה אומר לחיים בשוא ולא לחיים בפתח… וכתב עליו שם ר’ אברהם מפראג, בהגה” הה וז”ל ותמהני כי דבר’ אקלים חיים הם “כל הכתוב לחיים בירושלים ” בפתח בישעיה סימן ד’ ג’…. גם יעבץ כתב לחיים בפתח מודע בוודאי.